You can share that big moment of your life with your friends, family and loved ones distant on a free and better platform. Skype has always been in the leading track ever since the idea of video calling became more dominant in theworld. With up to 500 or more million users on the social networking platform, Skype has really earned a name in the green book of geeks. 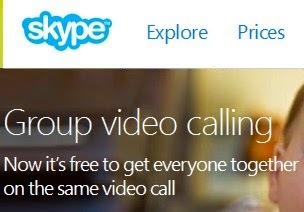 Before now, users can not make group video call on Skype at a free cost. Whats New On Skype Video Calling? Two days ago, i received a mail from Skype concerning the lifting of charges placed on Group video calling. I had to reconfirm the mail if it was actually sent mistakenly. So i waited few days to proof check if the mail was sent in error because i hadn't subscribed to any services of lately. No mail was received after two days, and i was able to confirm the fact that i was up to something good. Skype group video made free is one cute thing i'd loved to hear. -- Calling or video chatting with more than one friend at a time. --Make travel plans, group decisions or simply share your holiday photos with everyone on the call. --Get loved ones together on the same group video call — in just a few clicks. --Ideas can be shared within you and your friends for free and a host of others. It is an awesome experience though. I have always loved skype alot. But due to the fact that the network in my locality is running slow, audio and video seems to be giving big menace. You can call me whenever you see me online. I go by the user name Idaerefagha. Just in case you are looking for who to call, call me. Are you looking for an awesome gadgets to install your skype application? then you can try out some of the latest technology mobile phones. ** Group video calling is currently available on Windows desktop, Mac and Xbox One platforms, and will be coming soon on other platforms. Skype on Xbox One requires paid Xbox Live Gold membership. You shared some important points about skype group video call.